Becoming a mommy for the first time is a very exciting thing, and can be very overwhelming as well. Where do you start? What do you need? How are you going to do this?! Even if you're already a mommy, but having another baby, these questions come up again. And even more questions can arise. "How am I going to do it with 2? 3 or 4?! What can I do better with this new one that I learned with the first?" When researching items you might need for a new baby, there are all the usual items...diapers, and bottles...cribs and strollers...diaper bags and toys. But sometimes it takes being a mom to know what you actually want for your new bundle, and so we've chosen some items that you may not have thought about. They are items Every mommy needs, but might not know it yet! Having a new baby will bring out so many different emotions...and no matter if its your first baby, or your fifth, there are still worries you may have with your new little one. One thing I have noticed that all of the moms in the family do, (and us aunties as well), is they are always checking to make sure their new baby is still breathing properly. I remember barely sleeping, and constantly checking on the babies in the hospital while I stayed with my sisters. One amazing product we have discovers helps provide a peace of mind when it comes to this. The Owlet Baby Monitor "is designed to notify you if your baby’s heart rate or oxygen fall outside the preset zones." The Owlet tracks your baby's heart rate and oxygen levels while they wear the baby monitor sock. How cool is that?! The Owlet Smart Sock 2 is made of soft cotton for a comfortable wrap around your baby’s foot and is designed to grow with your infant. The sock can be worn on the left and right foot, so it's easy to switch for comfort. The sock comes with a bluetooth base station that has a 100 foot range, and will notify you if your babies oxygen or heart rate level falls out of range. If this happens, the base station will notify you with flashing lights and an audible sound, so it will wake you up when you're sleeping. The Owlet Smart Sock is designed for your 0-18 month old, and features a rechargeable battery that lasts up to 18 hours. Your Owlet Sock will come with 3 different sizes to grow with your baby. You get a 14-day free trial with your purchase, but fair warning, you're going to want to subscribe after you've sampled it. We love seeing the data all laid out and understanding the new baby's sleep habits. Owlet will give you great peace of mind, and even help you get some better sleep. And with the new Connected Care App, you can track and see the history of your baby's sleep, heart rate, and oxygen levels. The App is $7.99 a month, or $60 annually, and we think it is more than worth it. Here we have our rear facing 1 1/2 year old, and forward facing 5 year old in the same seat! This Chicco NextFit ix Seat is amazing! It is so easy to switch between newborn and preschooler without much effort. This is a perfect car seat for Gramma too, who can have any of her 6 grandkids at any time, and they're all a different age. There are so many great features on the NextFit ix, click below to learn all about it! The DockATot is a baby lounger that has many different uses. It's great and safe for co-sleeping, a nap on the go while traveling, diaper changes, and even helps with tummy time. No worries about your baby rolling or falling out, the DockATot is a "cocoon-like shape that helps mimic the womb." It's no wonder it is the 4th most-registered baby product in the U.S. It is super soft, comfy pillow like sides, and is very well made. DockATot comes in 2 different sizes. The DockATot Deluxe is for your newborn-8 months and fits 5-22 pounds. The DockATot Grand is Stage 2...for your 9-36 month babies, and 22-40 pounds. We got the DockATot Grand for our super fast growing babies! The DockATot Grand is 24 inches wide x 39-47 inches long. It has a clasp at the bottom, so it can be closed completely, or open up the clasp, and it can fit your taller little ones. It comes in about 10 different patterns, and you can buy the covers separately too, and change up the look of it. We got the Grand for my sisters brand new baby to use when she gets a little bigger, but when her big sister saw it, she fell in love with it! This precious one is 1 1/2 years old, and loves laying in it. She always pulls it down and says "night night!" The awesome thing is that it fits both her and her baby sister, so it's perfect. We'll take it on family vacations, use it during sleep overs, or just when this little one wants to take a nap on her own. We love our DockATot and know we will get lots of use out of it for years to come! Before you know it, your precious little new born will be spending lots of time on the floor. Learning to roll over, crawl, and even take their first steps. You start worrying how to keep your floors clean, how do you find time to get a carpet cleaner, so you can shampoo your carpets every other week, so your baby has a clean floor to roll around on. Well, we discovered Lorena Canals machine-washable rugs! They are made with "non-toxic dyes and with 100% natural raw materials, making them safe and healthy for babies and kids to crawl and play on." And you can just put them in your washer at home, and get it clean whenever you need! These machine washable rugs are so soft, decorative, fluffy, and durable. Our kids love this rug! We lay it out in Gramma's living room, on the wood floor, when the little ones come over. We like to take it outside with us, when its playtime, and the babies need a little more comfort than just sitting on the grass. Lorena Canals has so many awesome machine washable rugs. We had a list of our top 10, and could have kept picking some. We ended up picking their Tricolor Stars in Vanilla Rug. Our little one loves crawling around on it and playing with the puffy stars. We have used lots of different baby carriers and wraps with our 6 kids in the family. And Solly has quickly become a favorite for us. The thing about Solly Wraps, is that they are super soft, and extremely comfortable to the touch. No worries about rough fabrics rubbing against you or your baby. These Solly Baby Wraps are meant for your little ones in their first year, or up to 25 pounds. And everything is made here in the USA!! Yay! The Solly Baby Wraps have 2 different ways to wrap your baby. There's the newborn carry, and the classic carry. With the newborn carry, you can wrap your baby with their legs inside or outside. These wraps are so cozy, and tuck your newborns in snugly and comfortably. It makes it easy to carry your newborn and still be able to chase after your toddlers during your preschoolers soccer games...trust me, we do it every Saturday! Solly also have SUPER soft swaddle blankets! When the newest baby in our family was born this month, we made sure to always have these soft fabric swaddles for her. Everyone comments on how soft and cozy these swaddles are. They come in a great variety of colors, and you can save some money with you buy the Essentials Bundle with a Solly Baby Wrap and 2 Solly Baby Swaddle Blankets! "You grew your little one organically, so why add chemicals now? Only the finest 100% organic cotton, eco friendly dyes, and all natural wood will do for your little munchkin, and we’ve got plenty." We love the Baby Rattles and Big Buddies that are hand knitted in Peru! There are so many unique animals to choose from! We loved the Big Buddy Raccoon, and the Rattle Buddy, Kellen the Elephant. Finn + Emma has a great collection of play gyms as well, with these hand knitted, organic cotton and eco-friendly dye animals. They are unique toys, that we think the baby will grow up with and love forever. They also sell beautiful clothing, gender pieces, and lots of toys, play gyms, and rattles to choose from. When you have 2 little ones who are close to the same age, it is so fun to dress them in matching outfits! And Feltman Brother's has a great line of these sweet little outfits. 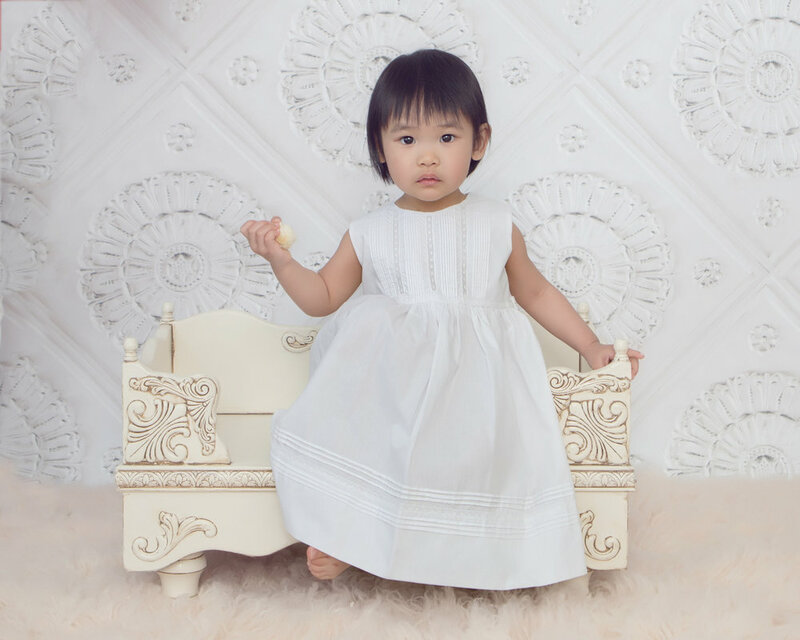 Feltman Brother's brings back the classic baby looks with their day gowns, diaper sets, and beautiful dresses. They have Christening gowns, Booties, Bonnets, and Rompers...everything you will need for your fashionable baby. We decided to get our 1 1/2 year old and 3 month old nieces, matching dresses and sweaters. They will be perfect for them come Spring, (although they'll be wearing the cardigans long before Springtime), and having these two little ones in their matching outfits, is so cute. This Lace and Pintucks Sleeveless Dress screamed sweetness. We thought matching dresses for Easter next year would be such a fun thing for the new baby, and this one seemed so perfect. It's a vintage like dress, that has "fine hand-sewn pintuckss and French lace inset design". The 3-9 month sizes come with matching bloomers that are detachable and has a ruffle trim on the leg openings. This sweet dress comes in pink and white, and goes up to a size 4T. We are paring this dress with the Hooded Button Down Cable Knit Cardigan (in the picture above), for the cooler night. It comes in 3 different colors, and in sizes 3M-4T. Perfect for sibling matching outfits. Our babies will be wearing the cardigan long before the dress, and it pairs nicely with so much! We're working on some more awesome products for your new bundle of joy, so stay tuned!